We like to motivate our kids to do certain things like behaving well, doing chores, and just being obedient. The reward for taking quick showers/baths is a turn in this. They only get one turn a month but it is a great motivator. I, on the other hand, let/make myself use it a couple times a week. I've not ever been a bath person. 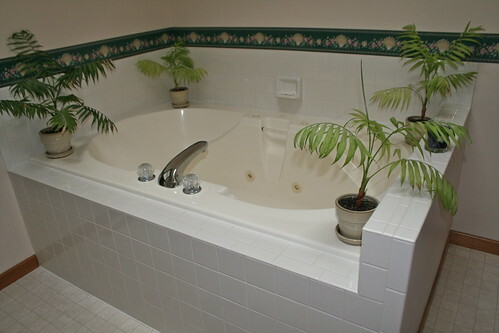 Maybe because I've not ever fit comfortably in a tub, but I fit in this one nicely and can soak for a good 45 minutes. It's a great way to relax. Sometimes I throw in salts or bubbles and light a candle. Ahh. I think it's calling my name right now. Better get the kids in bed first. Once a month? You taskmaster! : ) What a great idea! Love it!! You deserve some relax time! And thanks for the tour!